The city of Indore is located almost in the center of the country of India. It is the largest metropolitan city within the state of Madhya Pradesh, and has a large corporate presence established there. Indore is the hub for the country’s automobile, steel and alloy industries; agribusiness, especially in soybean processing; the garment industry; and is also in the middle of the Indian software services industry boom. The Indore Development Authority (IDA) is constantly working to develop affordable housing within the city for the many workers in the various industries. IDA Scheme 140 is a new public works development project creating a large colony of low-cost housing plots. The new colony is an important project within the city, and all of the new roadways within and leading up to the project are being paved with concrete. B.R. Goyal Infrastructure Pvt. 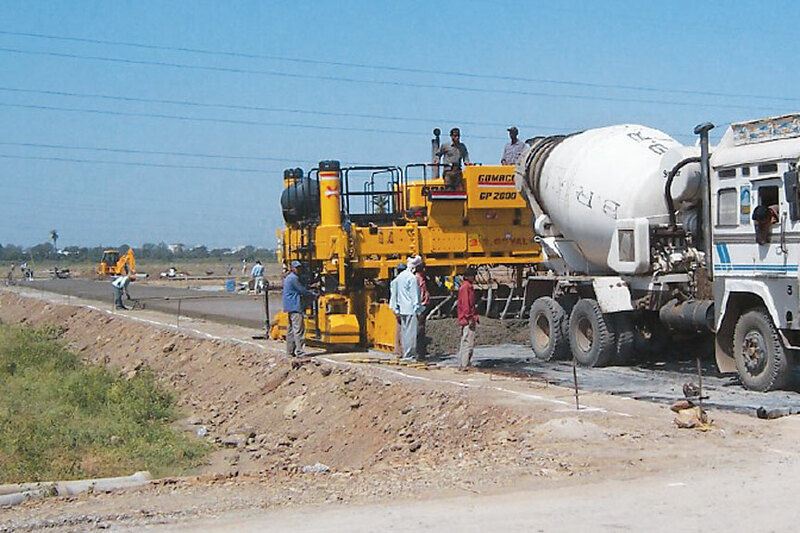 Ltd., based out of Indore, won the contract for the concrete paving on the project. They needed a new concrete paver for the project and turned to GOMACO for help. They wanted a paver that could slipform passes varying in width from 3.5 meters (11.5 ft) up to seven meters (23 ft). The paver they chose was the GOMACO two-track GP-2600. It would be the first two-track GP-2600 to operate in India. Paving on IDA Scheme 140 began in May 2007. The new colony will feature a city approach road 5 km (3.1 mi) long and 14 meters (46 ft) or four lanes wide. It is being slipformed in four passes with the GP-2600 paving 3.5 meters (11.5 ft) wide. New roads within the colony create an additional 5 km (3.1 mi) of concrete paving to the project. The width of the new roadways varies between five and seven meters (16.4 and 23 ft). Concrete depth on both of the projects varies between 200 and 330 mm (7.9 and 13 in). They are paving on a 300 mm (11.8 in) thick granular subbase with dry lean concrete for the city approach road. Dowel baskets are placed on grade every 4.5 meters (14.8 ft). The colony’s roadways feature a 200 mm (7.9 in) granular subbase with dry lean concrete, and baskets are placed on grade every three meters (9.8 ft). Indore is a city with a population of approximately 1.5 million people and the biggest obstacle to production is simply getting concrete to the site. Concrete trucks are constantly getting delayed in the city’s heavy traffic. A continuous supply of concrete that is a consistent mix is the biggest challenge B.R. Goyal faces, but it’s one that they’re learning to overcome. Production is averaging 500 meters (1640 ft) per ten hour shift. 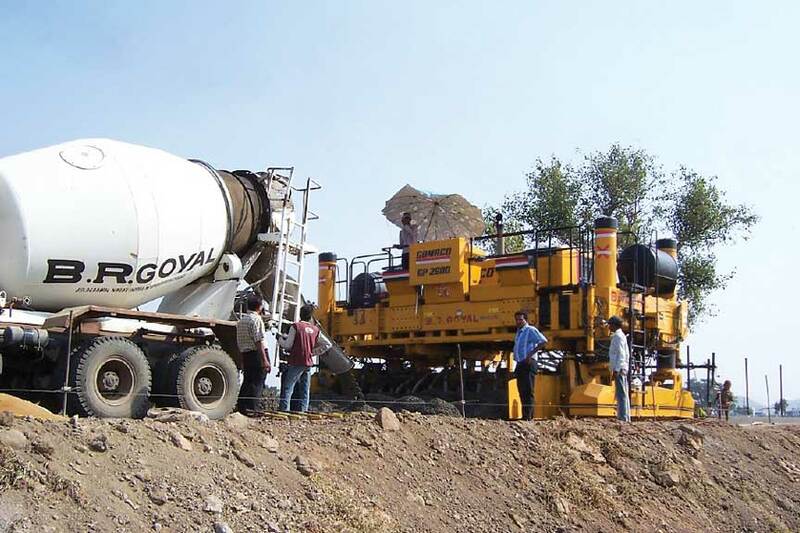 “The performance of our GP-2600 is good and we are getting a nice smooth finish,” Goyal said. 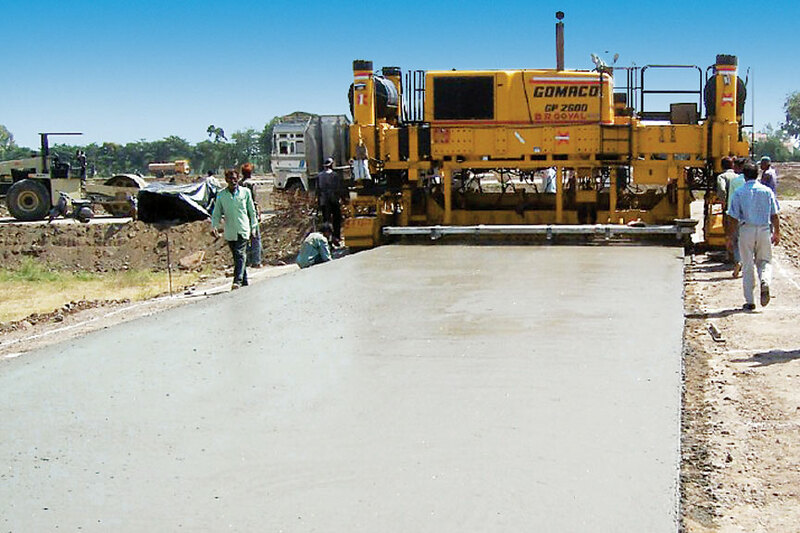 “We chose GOMACO because of their machines’ good reputations and the company has good paving experience. Their equipment is economical and easy to operate and they provide good follow-up service after the sale. A two-track GP-2600 slipforms a new roadway for an important housing colony in Indore, India.